1066 Project (leading to the Battle of Hastings). Though I have been thinking about doing this project for some time, it is meant to be on the slow burner, while I focus attention on ACW 12mm armies and my home brew rules for a hexed battlefield ........ but, the 1066 distraction is growing. The 1066 project is not intended to start before late June this year, however, I have just painted up one blister pack of Norman heavy spear and so a sense of enthusiasm encourages me to do an introductory post now. The following is just a ramble that outlines the planed path that will ultimately lead to a Hastings game later this year. Army wise - I am starting from scratch. 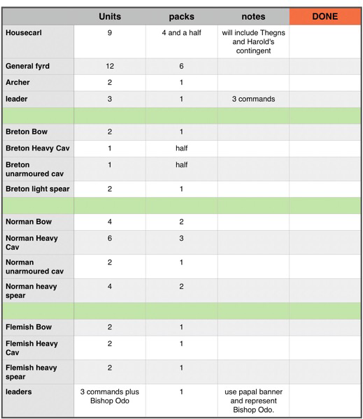 My chosen figures are from Kallistra's 12mm Norman and Saxon range (see the Resource Section for links), which generally come in blisters of 32 figures and 4 plastic bases, giving, for the infantry at least, 8 figures per base in two ranks. I am still feeling my way through this, but at this point in time, I see the game being played out on a board that is 12 hexes wide, with Senlac Ridge occupying either 8 or 10 hexes of that. If that remains the case, for the invaders, I will put the Normans in the centre under William, occupying a width of 4 hexes, with his left flank covered by the Bretons and the right by Flemish / Franco contingents, with each being two hexes wide. Using this as a benchmark gives a rough indication of the forces that I will need to buy and paint up and I have constructed a shopping list (below) to keep me on track. Painting - A Project Status page has been started over on my COMMANDERS website (link in the resource section below), which is intended to give a sharper focus to turning my gaming plans into real life results, certainly for this year. 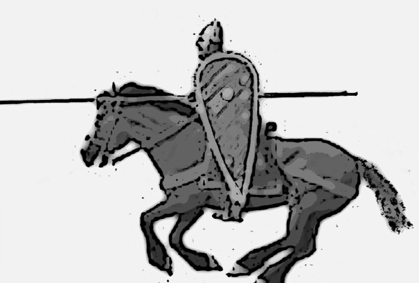 For the next few months, in addition to my current stuff, I would like to paint one or two Norman units (2 - 4 bases) a month, just to keep things ticking over until I pick this project up in late June / early July, just so that I get a bit of a boost to starting the armies off. Terrain - This is going to be a hexed game (kitchen table sized), using the 4" Kallistra Hexon system, with a grid that is 12 hexes wide by 9 hexes deep (similar to the scope of a Command and Colors board). Our central feature will be the long Senlac Ridge that will occupy much of the width of the table. To get this continuous ridge, I have been buying slope tiles, as the stand-alone smaller hills, although capable of doing the job, will not aesthetically look right and since I am investing so much time in getting the armies painted, I may as well make best efforts to get the terrain right. The boggy ground that flank the ridge to both sides will need to be present as will Asten Brook and some soft ground that runs either side of it. Since I am also planning on making 2017 a year of improving my terrain, I will likely take the opportunity to enhance my stream hexes with some extra grasses and the like. Rules. I am not fully settled on this yet, but the initial idea for doing a hexed Hasting game came from the fact that a couple of years ago, I had a Hastings counter and hex boardgame (see Resource Section) published and sold in a ziplock. It seemed rather a nice idea to do a figure version, though the space I am using here will provide a battlefield that is only half as wide as the boardgame map and so some bath-tubbing of forces and tweaking of rules, such as morale levels will need looking at. Since the whole thing is a bit of an undertaking, I will likely do both a boardgame conversion and look to do another ruleset (I have Basic Impetvs V2, Sword and Spear, Hail Caesar and Swordpoint rule sets), or even do an adaption to get a stand alone set of Dark Age hex based rules going - who knows! What is important is to represent the tough grind for the Normans of fighting their way up the ridge and breaking into Harold's line and also keeping the game interesting for the Anglo-Saxon player. The Project Progress page over on the Commanders website will cover the 1066 plans in monthly updates, though at the moment, prime time must remain with my ACW hexed based rules project, a ruleset that began over ten years ago, has changed format two further times and this year is getting a make-over, to better reflect where my thoughts on rule writing are at now. It is very close to being put up as a free set on my DropBox (thank you Dropbox). There was something of an inbound torpedo heading directly for my 1066 plans, as over time, I had bought three boxes of 28mm plastic Norman figures from Conquest Games (their cavalry, foot and archer sets) and I kept yearning to paint them up. Such a diversion would just spell disaster for either scale getting the attention that they need to get a game up and running and of course, going the 28mm route would take me a way from a hex based game. Oh Dear! To be both blessed and cursed by choice! Anyway, at this moment in time, it is only the 12mm that I have on the paint bench, so onwards and upwards as they say! 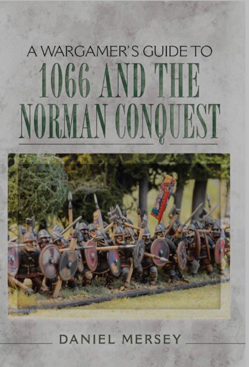 As an aside, I have just picked up the new Dan Mersey book from Pen & Sword called A wargamers guide to 1066 and the Norman conquest. I got the Kindle version, which is fine in this format (I like Kindle books, but have given up on Kindle based rules - much preferring to have the real thing in my hands). Anyway, there we are, some plans and good intentions, hopefully it will all lead somewhere. An interesting project for you to tackle and readers to follow! Not knowing much about the Battle of Hastings, I expect to learn from your discovery and development process of historical background, scenario design, and force composition, rules, troop interactions, and finally battle results. As for 12mm vs 28mm, who says both cannot be considered? Different scales might lend towards different gaming focuse and contrasting battle insights. Will a review of Mersey's book be forthcoming? Thanks Jonathan, I have skimmed though Dan's books more with a view of looking at the Norman / Hastings stuff, so didn't pick out the Gat Fulford / Stamford Bridge topics. I will go back in and do a cover to cover read and report back. I have Peter Marren's 1066 - The Battles of York, Stamford Bridge and Hastings, from the battleground series on my desk right now. I find that really useful and bought a hard copy even though I have the Kindle version. Sounds a very interesting plan Norm, I shall follow with interest! Ray, thanks for following. I hope there are some elements in the ACW rules that also catch your group's eye. I'll take a look, cheers! Great project, Norm. Will be following with interest! Thank Aaron, this is a project that is well overdue considering my interest in the subject. Have you seen the latest docu drama on 1066 on the BBC? Hi, yes, and was rather enjoying it. The three historians around the table having an argumentative narrative was a bit strange, but I thought everything else was fair stab at bringing something fresh to the screen. Part 2 tomorrow, will be watching - thanks, Norm. Your enthusiasm for Hastings over the years does occasionally tempt me to skip ahead in my chronological replay of ancient/medieval battles and just play it. But at my current rate will reach Hastings in about 2030 :-( What holds me back is I can just see I will throw out the chronological order and just start playing battles all over the place. Just can't bring myself to do that! So instead I will sit back and enjoy following your journey foryour minis version of Hastings. It is heresy in some areas but small units of 25/28mm troops work quite well on Hexon 10cm hexes. It is a different esthetic to larger units on a big board or using small figures but surprisingly has a pleasing esthetic of its own with the units being more like pleasing playing pieces or counters than a diorama. Enjoy it whichever route you go! Ross, That is very true. I am doing some writing at the moment on hexes and discuss the thing of 1 unit per hex and that because of that, basing does not matter (only aesthetically) and it is also true that each side could actually field a different scale, a couple of your mighty 54's against a sea of 6mm, technically you still have 1 unit per hex and so a system would work perfectly well, it's just the eye / brain thing that would get befuddled :-). I recently bought Peter Dennis's "Battle for Britain: 1066" gamebook. It includes very nice paper units (not individual figures), and rules that I probably won't use--I'm hoping I can adapt the units to your system instead! I realized was not clear about what I meant by "units": each consists of multiple ranks of full-color figures--3 cavalry or 3-4 infantry in each rank. There are also banners, baggage, terrain, etc. All-in-all a very nice piece of work. There are several other books in the series--ECW, WotR, and the Roman Invasion. I may go for the last, but I haven't seen whether it matches up to 1066. Hi Chris, in the below link, the chap uses those card armies, but I think he uses the Dux Bellorum rules. Anyway, it might be worth a look at that post and the previous one to see his units in action. Thanks for the link. I go to his blog pretty often, but somehow missed those posts. Have you tried Dux Bellorum? I have the rules on my Kindle, but have not played them, they do read rather well though.